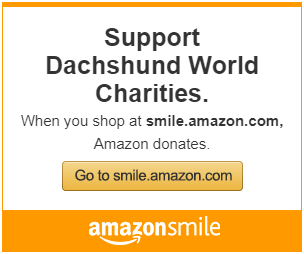 Please register your email address with Dachshund World Auctions! ​Dachshund World Auctions is currently running a fundraiser to help our friends in need of veterinary medical care. Please join us and help us, help them. Would you like to "Help us Help Pets" Please donate now and help save a life! Just click on the "Donate" button below, select your donation and you have just helped us make a difference! ​Got Questions? We Got Answers! Drop us an email, we would love hear from you! Enjoy the wee-slide show below, these are some of the babies we have helped since 2012 and some of the photos you see are well....we just think they are really freak'n cute! Sandi Voyles and her boy, Sam. Thanks to everyone who participated in all ways to help make this a successful auction! Once again, we must put out the call for your help. Three more of our Doxie extended family are in need of veterinary care, and their humans need funding, to enable them to provide that care. Bella is the fur child of Jenny Crocker. Bella has a tumor/mass that needs to be removed. It is putting pressure on a nerve, and preventing Bella from being able to walk. Kenzie is the fur daughter of Dana Spencer. Kenzie has IVDD, and is being treated with acupuncture. Dana needs our help, to fund those treatments. Greta is Tony Toni Ashley's baby, and is in need of multiple surgeries, to remove mammary gland tumors, and for inguinal hernia repair. ​Hi! I'm Goyle! I am a 3 1/2 year old miniature Dachshund, from Mentor, Ohio. I live with my Kitty brother, Gink, a 20 pound black cat, my mom Cindy, and dad Dave. My parents got me when I was 6 weeks old. Shortly after, my mom got pretty sick. She says I was the reason she got out of bed some days. We bonded and became bff's. It was a long road, and her losing her job ruined us financially. But, we all had each other. ​My mom still suffers daily with her illness. Just as we were getting on our feet I suddenly became paralyzed. After a couple of emergency vet visits they said I needed surgery immediately. Time was of the essence. We traveled to Akron and I got emergency surgery on my back. Dr Crane was amazing, and they all fell in love with me. The surgery went well, but they said I can never go up and down stairs, or jump on and off furniture, because my back is not good. My mom and dad borrowed from everyone they could, to pay for my surgery, but they are really hurting, because they put off the main bills to help me. We have to figure out ramps and all that stuff eventually, but for now we are just struggling to survive. Please help us. We promise to pay it forward, and we appreciate everything and everyone, even if it's just prayers and positive thoughts. Dachshund World Auctions is raising funds to help two of our members. Pamela Way, the owner of two rescued doxie babies, Penny and Willowand Roberta Bauer, the owner of a sweet little longhair dachshund named Honeydog. Penny and Willow are in need of serious dental work and Honeydog was examined to find a bump on her stomach and when examined by the vet she was found to have a bulging hernia which could cause major problems and requires surgery. Both Pamela and Roberta are wonderful dachshund moms and live on fixed incomes. They love their dogs tremendously and need a little help from their friends! Paul Sabin and his Fab Four: Steve (who has just been diagnosed with compressed discs), Willie, Angel, and Belle. Lana Tiner and her pup Duke, who needs vet care for problems with his kidneys. Manda Hicks and her pup Lily (hip surgery). To view the entire auction, click photos, then the album titled 'Helping Friends 4"
If you would like to be invoiced for your winning items, would you please register with DWA so that we have your PayPal address and shipping address? Thank you so very much! If you wish to make a donation rather than bidding, you may paypal the amount to dwchelpingfriends@gmail.com and select payment to "friends & family". Meet Emmett - Emmett has been suffering from IVDD. He injured his back a little less than a year ago and was fine after 8 weeks of strict crate rest and medication. Not long ago, on his fifth birthday he re-injured is back. Emmett's owners, Laura and Joe, have been going to their vet for laser treatment to help the healing process hoping that crate rest would fix the issue. After an appointment with a specialist and a planned round of acupuncture they were hopeful the specialist could shed some light on why he seems to be in so much pain still despite being on all these medications and why they had seen little improvement. The specialist, upon examination had concluded that Emmett was not getting any better due to a severe herniated disc. Laura and Joe had little choice for Emmett's full recovery without surgery. The surgery is very expensive and Laura and Joe have very limited funds and asked for some help. They made the right decision to let Emmett have the surgery! Emmett had successful surgery on Friday, October 17th and we are all pulling in to help Laura and Joe with the financial cost of that surgery. Meet Sam - Sam is an ODR (Oregon Dachshund Rescue) 5 year old black & tan mini dachshund and is the grand puppy of our member, Connie. Connie co-owns Sam and came to Dachshund World seeking assistance for medical cost assistance for treatment of Sam for what has been diagnosed as a collapsing trachea. Sam has been suffering from this condition for sometime and the costs have exceeded this family's ability to pay. Medications have been insufficient and he is looking at proceeding with surgery. ​Meet Penny, age 5 & Willow, age 3 - This beautiful pair were rescued by our member Pamela. Pam came to us looking for financial assistance to help with Penny & Willow's vet treatment for vaccinations and tapeworms. They have had to have an intestinal parasite screening, flea treatment. injections and prescribed medications.